We may have not often heard of Manipur in mainstream media, or the only way we recognize this state is for its infamous border issues and insurgency problems. What remains unseen is that Manipur, which is one of the seven states in North East region has embraced the transgender population and proved to be more resilient towards them as compared to the rest of the nation. Sixty percent of the Imphal; the Manipuri capital, beauty saloons are run by transgender and gay community. This has provided them with economical viable option as the job of beautician, makeup artist, fashion designer doesn’t require academic qualifications. Besides this, the state is also hosting Transgender beauty queen contest since 2000 which reflects the supportive attitude of the state towards the unidentified gender. 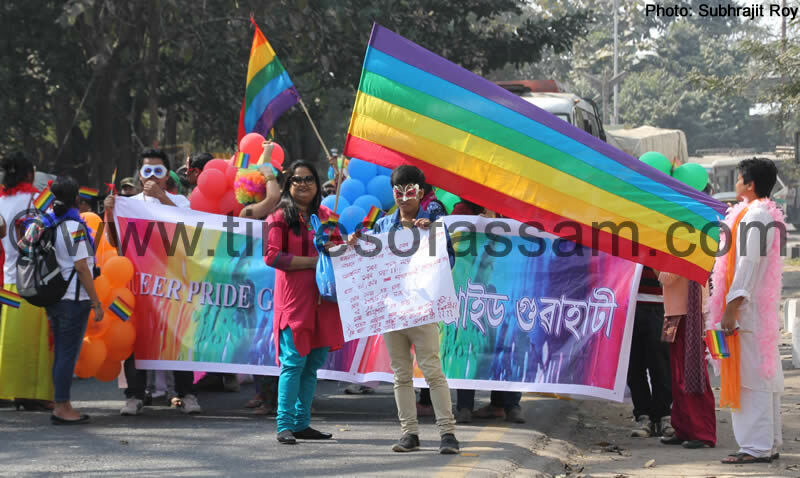 This time, North East Transgender Queen Contest was organized in December 2013, depicting their solidarity against the supreme verdict on Section 377. The contest held, depicted the acceptance of the alternative sexuality by the state and, also their support for their cause. The transgender queen contest was first organized in 2000, and is conducted every year reflecting Transgender, male trapped in a female body or a female trapped in male body, often are the people who are shunned by the society and family, and often excluded from populace. One may not spot them in corporate offices, shopping complexes, or in public places as they are treated like the forbidden fruit of the society. The third gender – Hijras, transgender , kothis may have been ostracized by the society, but Hindu and Greek mythology still holds many stories about them. One of it being from the Ramayana, in which when Ram leaves for exile, all his followers accompanies him. He then asks all the men and women to return back to the kingdom. But hijras, who neither fall in both category, continued to go with him. Seeing their devotion he blesses them with the power to confer blessings on auspicious occasions. That’s why it won’t be surprising if you see hijras singing and dancing during functions like childbirth and marriage. Alas! Their presence is accepted only then and at that level. Our nation may have entered into digital age, adopted western culture and become globalized .But the plight of transgenders remains unseen till now. Why are they being discarded from our society, when they are blessed by the Gods who are worshiped? According to Article 21 of Constitution of India, all its citizens are guaranteed right to life and personal liberty. It follows “No person shall be deprived of his life and personal liberty except according to procedure established by law.” But the major problem that confronts our constitution is the recognition of the third gender. They aren’t included in the official documents like ration cards, passports, driving license, voter id card etc. They are not officially recognized as citizens of India. So, how will they claim their right! The population census 2011, which for the first time included transgender in the other category gave these faceless people a hope of their acceptance in the society. It was estimated roughly that transgender community constitutes around 500,000 of the total population. Transgenders besides being outcast, have to deal with enormous problems from accommodation to illiteracy to unemployment. The main source of their income is often begging or prostitution. No department of Central Government has been assigned to look into their issues nor have any policies been formed to help this marginalized section of the society. As Lok Sabha election 2014 is going on, even the forgotten regions and lands are being visited by our competing leaders. It wouldn’t be uncommon to find some leader is sitting on protest, or another having tea from road side vendor or some the visiting poor’s houses. Yet again, how many leaders have we seen talking to transgender community? Neglected by everybody, the only support system they have to themselves is their community which stands united. Their unity can be seen in Koovagam festival which is celebrated in Koovagam village of Tamil Nadu in month of April or May every year. Transgenders from all over the country attend this festival in which they sing, dance and discuss their issues. Also, contest like Miss Koovagam is held to motivate them and gives them space to appreciate themselves. Over recent years, the festival has the added advantage as it becomes another hot item for media coverage. The media has acted as a platform for transgenders to bring out their issues in front of Government and public and also a way to assert their existence. Though most of the states haven’t heard their plea, the state which has bothered till now to integrate them into mainstream society is Tamil Nadu, which had set up a transgender welfare board in 2008. The Tamil Nadu government issued them separate food ration cards and has also decided to issue them identity cards. Moreover, even the media has provided them push in order to break the taboo. Vijay TV started a talk show which was hosted by a trans woman. A transgender was assigned a lead role in the Tamil movie Paal. Also, transgender people like KalkiSubramaniam; India’s first transgender entrepreneur who hailed from Tamil Naidu has been cast in lead role in a Tamil movie. We have been made to believe that there is no alternative. Our society, which treats them like rotten seed, also makes us believe that they don’t deserve any better than that. They are feared and often seen as ailments in the so called sophisticated society. But state like Tamil Naidu and Manipur, have put an example and challenged the common beliefs that majority holds towards transgenders. They are part of our society and they should be included in the same. Government should make policies and set up departments for their welfare. Education schemes should be extended to them. Reservation for them in educational institutions, government jobs should be made mandatory. They should be issued ration cards and voter ID cards, which would help them to have a legal identification. According to Hindu mythology, they are God’s people, then why should we treat them as diseased ones?